The family of a Sheffield student who faces extradition to the United States has confirmed an appeal has been lodged by lawyers. On 13 March, Home Secretary Theresa May approved the extradition of 23-year-old Richard O'Dwyer, who is accused of copyright infringement. The US authorities say Mr O'Dwyer's TVShack website hosted links to pirated films and television programmes. A spokesman said Mrs May had "carefully considered all relevant matters". Mr O'Dwyer had until Monday to appeal against the home secretary's decision. 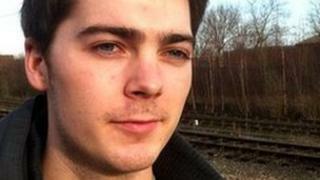 His mother Julia, from Chesterfield, confirmed that lawyers had lodged papers appealing against the extradition. She has previously said her son had been "sold down the river" by the government. Westminster Magistrates' Court ruled in January that Mr O'Dwyer could be extradited. The Sheffield Hallam University student said he was "surprised" when police officers from the UK and US seized equipment at his home in South Yorkshire in November 2010. The case was brought by the US Immigration and Customs Enforcement agency, which claims that the TVShack.net website earned more than $230,000 (£147,000) in advertising revenue before US authorities obtained a warrant and seized the domain name in June 2010.